A funny thing happened to me last week. After years of denial and deflection, I finally agreed to owning my success. Now this might seem like an odd statement, but I expect that the vast majority of women out there don’t, won’t or feel they aren’t deserving of their success or praise when they’re singled out. How often, when faced with public recognition for a job well done, women say things like: “it really wasn’t me, it was a team effort’, or “ I thought they had read out the wrong envelope”, or laughingly mutter, “I’m really not sure why they chose me – you should see the calibre of the other candidates”. I said all of those things last week, but by the end of the week I had stopped saying phrases that diminished my achievement and dishonoured my champions, and had started accepting that I too am deserving of recognition and reward. Finally I learnt how to accept acknowledgement of my accomplishments with grace, new-found confidence and a smile. I was honoured by some truly remarkable women who had thoughtfully nominated me for the Telstra Business Woman of the Year Award. And I won – both the Entrepreneur category I was entered into, and then the main award of the night: the Telstra Victorian Business Woman of the Year. The joy these moments delivered to my family and me last Tuesday night was priceless. Sharing this with my parents, both of whom are entrepreneurs, was the most fun of all. Watching their eyes light up as my name was read out and then kissing both of their faces, damp from their happy tears, is a truly golden moment that is constantly on replay in my mind. They have played a huge part in my success. I stood on the stage and looked out at the crowd, and I felt something deeply empowering in that final moment before I started to deliver my speech. I was finally ready to accept that I had earned my success and I was able to stand tall, alone on the stage and completely own the moment. Virtually no one stands alone on a stage like that without the benefit of contributions from great people who have inspired and directly supported the path to success and opportunities that have given rise to remarkable outcomes. Acknowledging those people and opportunities is very important and typically easy to do – it’s a great pleasure to work with talented people and deeply satisfying to share success with others. Publicly acknowledging your role as the change-maker is far harder. Leading up to that moment I was riddled with the typical self-doubt that many women feel. I was so impressed, listening to the business and career stories that night – women who led multimillion dollar organisations, they were feeding the homeless and working with the vulnerable, they were educating, creating hope and change via research, developing wonderful new services and products and getting them onto world market, smashing all sorts of extraordinary career goals. I was suffering from imposter syndrome – big time. Even the most courageous and the boldest of us feel this from time to time. For those of you who know me, you’ll agree that I’m usually a pretty confident type, sometimes bolstered by lucky charms and courage-inspired rituals when I think I need a little extra support. But for some women, imposter syndrome can stall or even completely derail careers. Dr Pauline Clance and Dr Suzanne Imes in 1978 studied a group of highly successful women and found that although the women were high achievers in their various fields, the overwhelming majority struggled to internalise their success – pointing more to other factors such as luck, support from others, as opposed to their own knowledge, skill and determination. Clance and Imes coined the phrase ‘imposter syndrome’ and it’s alive and well forty years later, likely to be found lurking in the minds and negative self-talk of every woman at some stage and phase in their life. Women who allow imposter syndrome to dominate their thinking and behaviour are less likely to take risks, procrastinate to avoid failing and can fall into the ‘expert trap’ reducing their ability to seek new knowledge and experiences to broaden their employment opportunities or professional networks. Australia’s innovation industries simple can’t afford for this to happen, as we need every great mind – be it women or men – at the table to develop the knowledge economy that we so desperately need to accelerate. I also realised that deflecting or dismissing my success was to diminish and dishonour my champions – the women who had nominated me, the judges who had selected me, as well as Telstra who had publicly backed me. If you’re like me you probably enjoy giving gifts as much as receiving them, maybe even more so. Watching someone accepting gifts of praise and reward with grace, humility and with delight is both fun and very satisfying. I realised that by owning my success and embracing my moment in the sun would bring my champions so much joy. As my dad said, ‘Luck had bloody nothing to do with it. Focus on the facts. These people can’t all be wrong’. So I focussed on the facts. I had given the judges the complete story, warts and all, the milestones I had delivered, the risks I had taken and challenges I had faced. People I admired and respected sent wonderful messages of support, confirming that I deserved it, that it was no surprise to them. In my darling Dad’s words: ‘You make your own luck’. Women in Australia don’t talk enough about ambition out aloud. ‘An ambitious woman’ is a negative phrase that harks back to the 1950’s, meaning a social climber. Women don’t seem to have reclaimed this concept, turning it into a positive statement, just like so many other phrases that are struggling to be recast in a positive feminine frame such as ‘bossy’ and ‘feisty’. I made sure I worked in ‘…and I am ambitious’ into my speech that night. I’m officially reclaiming ‘ambitious woman’ and adding it to the list of positive feminine attributes for which to strive. Women tend to be type-cast as great networkers, effective collaborators, good team players which can sometimes work against standing alone to be singled out for praise. We can be both – they are not mutually exclusive. Modesty and self-deprecation is too often driving women to hide their achievements so as not to alienate or separate themselves from other colleagues, or not to be labelled as a tall poppy inspiring jealously or considered self promoting (as if self promoting is a bad thing) or even worse, intimidating our male colleagues and partners. The more women who embrace this behaviour of deflecting praise and reward for their successes, the more we hold back other women and reduce the advancement of an equal intellectual future for women. This behaviour is not helping and we much recognise it for the damage it causes to other successful women as well as ourselves. So here I stand – tall and confident, resilient and grounded – and give myself a public pat on the back – for I have worked damned hard and I’ve taken huge risks – and my successes are sweet. For if it were not for my drive and ambition, my desire to learn and succeed, my willingness to take risk, then the achievements listed against my name in the past ten years would not have happened. The intellectual capabilities and expertise I bring to the table are of high value, and I’m fun to work with. I am proud to stand beside some remarkable women and men who have championed me, mentored me and pulled me aside when required, to set me back on the right path. Ms Michelle Gallaher is Co-Founder and Creative Director at The Social Science. Her expertise encompasses healthcare and biotechnology having worked in biotech start-ups, major teaching hospitals, research organisations and pharmaceutical companies throughout her 20+ year career. As former CEO of the BioMelbourne Network, Michelle developed an international professional network. Passionate about small business and entrepreneurship, Michelle is an influential advocate for women in science, technology, engineering, mathematics and medicine (STEMM). 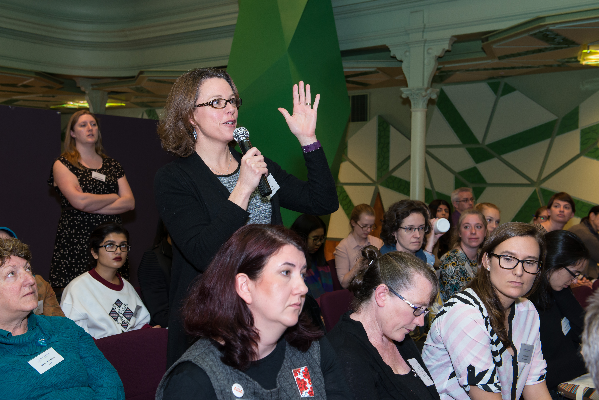 Michelle is also a TEDx Melbourne alumni, an avid blogger and tweeter, and regularly speaks on innovation in Australia and women in leadership. She is Co-Founder and Creative Director of Women in STEMM Australia and is keen to encourage more women in STEMM to become entrepreneurs and innovators. Michelle recently won the Entrepreneur category and Business Woman of the Year for Victoria at the Telstra Business Women’s Awards.